Please Note that the New York State Math Test will be on May 1st and 2nd. The students need to review nightly ALL of the material for the year. Please help your child succeed. The homework they receive will help them. Please make sure it is done. Grade 6 Finish Packet. Extra credit Mathletics. Study and review for State Test May 1st and 2nd. Practice using calculator. Write questions down on material you are not sure of. Grade 7 Finish Packet. Practice using calculator. Review for State Test. Study and write questions on material you are not sure of. Mathletics is available for extra credit. Grade 8 Finish Packet. Do Mathletics for extra credit. Grade 6. Finish the packet that was given out on Thursday April 4th. Grade 7-1 Practice Coach pages 234, 235,236 and 237 on Looseleaf. Show all work. Grade 7-2 Practice Coach pages 186,187,188, 189 and 190 on Looseleaf. Show all work. Grade 8 -1 Crosswalk pages 305 and 306 on Looseleaf. Homework is assigned on a daily basis. The purpose of homework is to reinforce skills and concepts taught during the school day. I am asking that parents check their child’s homework daily. Some parents have made it a practice to initial the homework. Students should also make it a practice to review notes and study on a consistent basis. Math students should practice their multiplication tables and numbers. Grade 6 do packet. Make sure you read the examples. Mathletics assignments have been posted till 3/8/19. This is extra credit for the Second Trimester. Also March Mathletics Madness is on. Play Mathletics and get rewarded. All Grades! Homework due Monday February 25th. Grade 6 Finish worksheet. Make sure read before doing. Grade 7 Finish worksheet. Show your Fomula and Work. Grade 8. Math book pages 235 – 238. Read and do the questions. Grade 8 pages 223 and 224. Grade 6 Finish worksheet, both sides Show Work! Grade 7 page 140 on Looseleaf. Show work! Grade 8 Crosswalk Page 146 on Looseleaf. Show work. Grade 6 Finish classwork and also do Page 160 and 161. Grade 7 Finish pages 133,134, and 135. Grade 8 Crosswalk plus pages 141 to 145. Grade 8 page 205. Make sure you graph the problems on Graph paper. Fix class work. To be Graded. Grade 7 pages 126 and 127 in Math Book. SHOW WORK! Grade 8 Crosswalk Book Lesson 12 Slope and y- intercept. You may write book, but MUST SHOW WORK! HAVE A NICE WEEKEND. REMEMBER TO THINK ABOUT BEING RESPECTFUL. Grade 6 Math book page 153 WORK MUST BE SHOWN! Grade 7 Math book pages 123,124 and 125. MUST SHOW ALL WORK. HOMEWORK BEGINNING THE WEEK OF JANUARY 7, 2019. GRADE 6: PAGES 142-143, 144. GRADE 7-2: FINISH CLASSWORK. SHOW WORK ON LOOSE LEAF. HOMEWORK BEGINNING THE WEEK OF JANUARY 2, 2019. Grade 7-1: pgs. 69 and 71. Grade 8: pgs. 185 to 187. Grade 7 – 2. Practice Coach book pages 36 and 37 show work in Notebokk. DO NOT WRITE IN BOOK. Study for quiz. GRADE 8 page 29. Study for quiz. Grade 6-1 Math book pages 8 SHOW WORK IN THE PROVIDED AREA. 6th Grade worksheet whole number operation. Congratulations to our 8th Graders who received scholarships and were accepted to Honors Programs in Catholic High Schools. 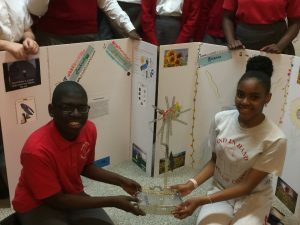 Joachim and Anne students displayed the St. Julie Billiart Sunflower STREAM Project at the Aquinas Exposition 2017. Van Gogh’s Sunflowers -five flowers in a vase has been the most visited painting in England. 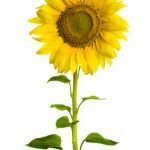 These flowers are bursting with meaning while representing the natural cycle of life with a supernatural glow. 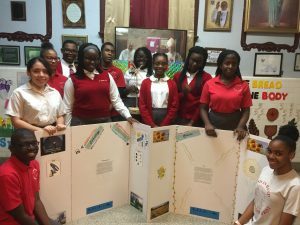 His flowers along with St, Julie Billiart’s inspiration energized the students to use Science, Technology, Religion, Engineering, Art and Math into developing the many facets of the project. Mr. Corso, our Assistant Principal, was the Moderator. 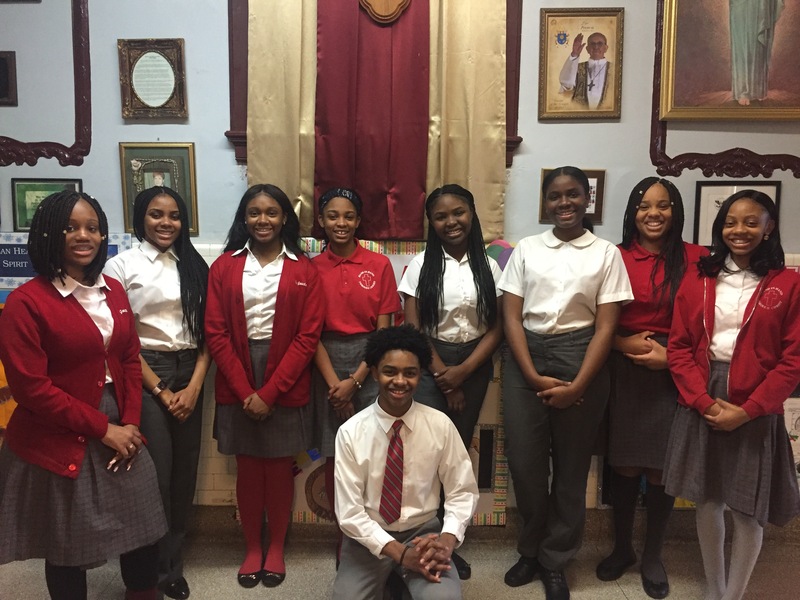 SsJA’s Proud Aquinas Members are: Angie Bermeo, Rousseau Francois, Chelsea Mullings, Jessica Casamajor, Lauren Hedge, Jared King, Jonathan Laura, Divia Myers, Ashley Predvil ,Shelsy Fils Aime and Melodie Cadichon. Congratulations to All!! !